Four ways sales associates can make themselves more interesting to customers. Sales Skills by Peter A. Marino Ph.D.
Drive customer’s of mine away. Because tomorrow, who can tell? To spend his dollars all with me. Clarence Darrow once said that his success as a lawyer was due to the fact that he could make the jury regard the defendant as a friend instead of an enemy. “People don’t hang their friends,” he said. 1. Work at becoming an interesting person. Read, learn and follow your interests. Be active with family, business and community activities. A big part of becoming a successful salesperson is to work on self-development. Customers are attracted to salespeople that seem to be interesting, terrific and fun. Ever wonder how the word ‘terrific came to have a positive meaning’, even though it originally meant to scare someone? That happened because at least scary people and scary things are not boring! That is the reason why millions rush to see scary films. Students don’t like boring teachers. None of us likes boring fathers-in-law, mothers-in-law, brothers-in-law, sons-in-law, etc. The point being made here is that we should interest people without scaring them. Charles Roth came up with an excellent way to think about how to become an interesting person. He said, “To be interesting to others, all you have to do is show more interest to others.” You will unlock the secret of Mr. Roth’s statement if you understand that: It’s not how interesting you think you are to others; it’s how interesting others think you are to them. Here’s another tip on how to be interesting to your customers: Flow with and not against them. In short, do not argue with them, do not try to outsmart them, do not do anything to antagonize them. Remember that selling is not a battle of wits. Don’t top your customer’s stories. 2. Find out about customers’ common interests so you can connect with them on an emotional level when necessary. Remember it is not always necessary to be too anxious to get this information upfront because these interests may come out organically as you help them to plan and furnish their rooms. Many people like to talk about themselves. Get to feel the customer’s interests by acknowledging them. 3. Become knowledgeable about furniture and interior design. Customers don’t want to discuss choices that will affect their home environments with sales associates who know less than they do about furniture, bedding and interior design. Watch design oriented television shows and read home design magazines. Keep abreast of current trends. Study furniture construction and styles. Know your products inside and out. Having become knowledgeable, remember that you want to use your expertise only when required. 4. Remain interested in people. Get to know a lot of the folks that live in your area. Make it part of your job to participate in real and virtual social networking to get to know people and develop personal relationships with them. These relationships can be formed where you do your banking, at local restaurants, in classes you take and just about every place you visit. Participate in online social networking by blogging, and on sites such as facebook and twitter. 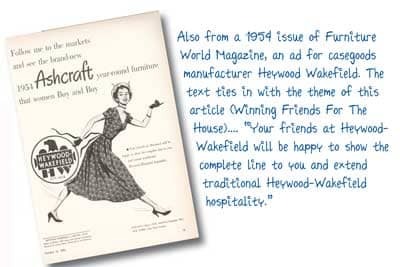 In case you missed them, read Leslie Carother’s excellent Furniture World Magazine series that discussed the use of social networking tools. Also read Mark Lacy’s article on business card marketing from the September/October issue, and Margo DeGanges three part series that deals with how to create and nurture a “tribe” that loves you and your business. All of these articles can be found on the furninfo.com website or email editor@furninfo.com to get a list of quick links. Corporate trainer, educator and speaker Dr. Peter A. Marino has written extensively on sales training techniques and their furniture retailing applications. His books “The Golden Rules of Selling Bedding”, “Stop Losing Those Bedding Sales”, and “It’s Buying, Silly! are available online at www.furninfo.com/store or by calling 914-235-3095. See many of his sales skill articles on the furninfo.com website. Questions on any aspect of sales education can be sent to FURNITURE WORLD at pmarino@furninfo.com.